Weaving techniques are centuries upon centuries old. Discovered by every group of people on earth in one form or another, they were likely one of the very first arts to be created, as weaving comes out of necessity. Textiles, rugs, mats, and other items that we use daily were all made possible at one point through weaving. Even today, after millennia of development and technological advancement, weaving continues to have a big impact on the sculptural shapes and designs of things that we use all the time. Some we have been weaving forever; others are more recent inventions. Lighting is one of the most recent and most unexpected home accessories to benefit from ages of human experience with woven materials - and yet we are seeing more of these lights bringing a handmade, artisanal feel to many modern interiors. Rattan, bamboo, abaca and other natural materials are being used to create some stunning lighting solutions. We love the organic shapes and the unique glow that woven lighting provides. And as you can see, there is much to choose from in the world of beautifully crafted woven pendants for your home. The Sinnerlig pendant lamp is part of IKEA's newest collection. Designed by StudioIlse, the design firm of famed interior designer, Ilse Crawford, the design is all about celebrating natural form. 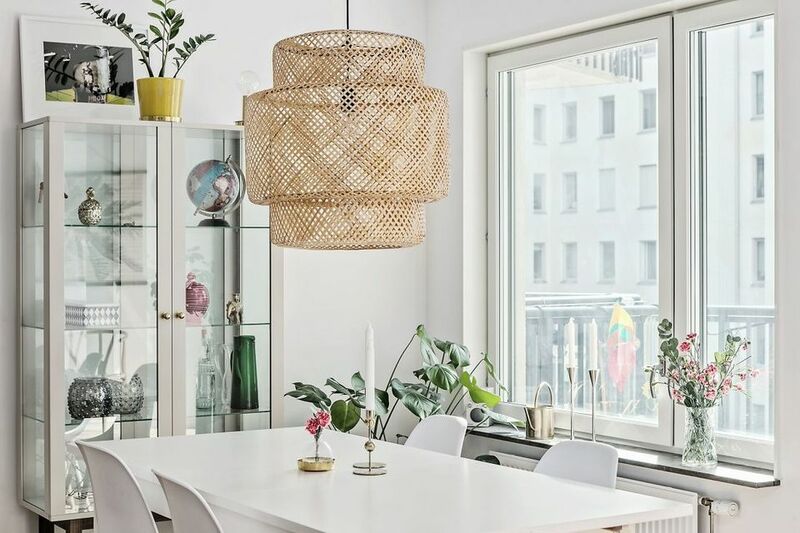 The bamboo-latticed pendants are particularly striking, designed to be "helpful background pieces...simple useful forms that fit into everyday life," according to the British designer. It is the simple form that allows woven lighting like this to truly shine in the home. One, two, or a group of these lights hung above a dining table are sure to make quite an impact. Artisan Living brand is known for sustainability in the design of its products. All items are impeccably made, offering a unique global appeal. We fell for the company's Lumina Bamboo Pendants. Using split bamboo, these pendants have been woven to be light and airy. These pendants are perfect for the most modern of spaces, adding a warm tone to a space. With roots in Serbia, New York-based artist Ana Kraš brings a global perspective to her work. Her vision extends from Brooklyn to Haiti, where she worked to create a woven lighting collection. Her Bonbon Lamps are one-a-kind pieces of colorful lighting. Each piece is handmade and woven with thread in a variety of hues to create the oversized lamps. We love Ana's use of color. When the lamps are turned on, the rich shades of pink, blue and yellow found in her weaving truly shine. Hailing from Wales, designer Louise Tucker is fascinated by woven design and three-dimensional structures. Tucker looks at hand weaving as a way of experimentation, and through her experiments, creates large-scale lighting that is multi-dimensional and beautifully sculpted. Beyond the craftsmanship, the most impressive part of Louise's work is the light that shines through her pendants. Subtle and unique forms appear on the walls - yet another part of the artistry of these woven light pieces. 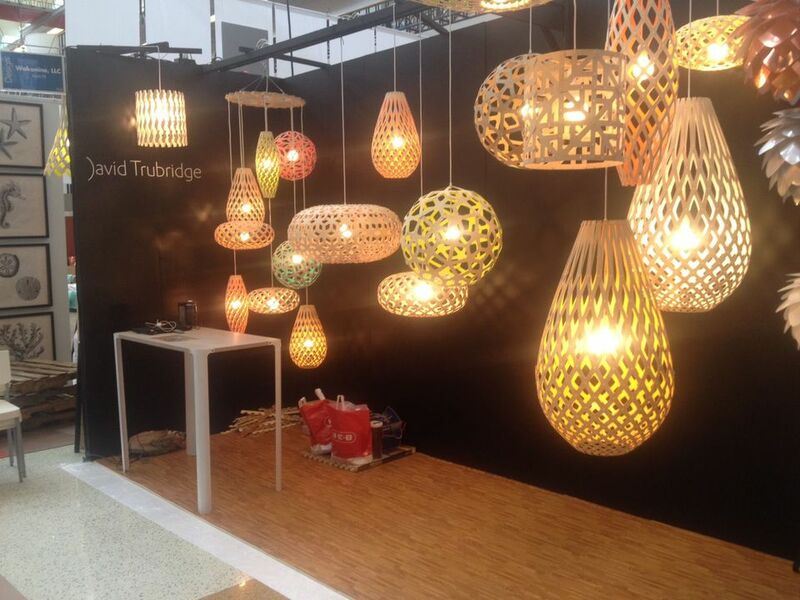 Designer David Trubridge's love of nature wends its way stunningly his work. A sailor and world traveler, Trubridge has traveled by boat from Britain to New Zealand, studied the shapes of crystals in the Antarctic, and coral in the sea. Made from natural, sustainably-grown materials, the design of this artist's pendants reflect shapes and silhouettes found throughout nature. Beautiful pieces of functional art, each written as it's own unmistakable ode to nature. Woven lighting by David Trubridge is even more stunning in color. The New Zealand designer also offers his cool pendants with colorful accents. Bamboo lighting can be finished in shades of aqua, yellow, orange or pink. One of Trubridge's first designs, Hinaki was developed in 1995, inspired by the shape of fishing traps. Today, the organic design takes on a new and modern shape with color-coating within the design, giving the light a saturated glow. Roost's Bamboo Cloud Chandelier Collection was created by a young Thai artist who trains fishermen to use bamboo weaving traditional techniques in a more contemporary and non-traditional way. With designs like cumulus and nimbus, this collection of woven bamboo lighting takes on a natural shape, inspired by cloud formations. To produce these innovative pieces, young fishermen are trained in traditional weaving techniques to create non-traditional forms that result in the Cloud Chandeliers. They are beautiful and ethereal woven lights. What is the Right Sized Light for Your Pictures?